DENVER — CBD, the cannabis cousin to marijuana, is one of the hottest topics in health right now. The cannabis compound can be found in health food stores, supplement shops, or marijuana dispensaries. Even Walgreens and CVS pharmacies are jumping on the bandwagon. But Contact7 found that consumers need to educate themselves to be sure what they're buying is safe and beneficial. After trying CBD for the first time three years ago, Jessica Robinson almost swore off it forever. "I was hoping to get some relief from my anxiety, but basically it gave me one of the worst panic attacks that I’ve ever had," said Robinson. Looking back, Robinson said she believes the product she was sold likely contained marijuana and high levels of THC. As a standard, CBD products are supposed to have less than 0.3 percent THC and should not have the psychostimulant effects of marijuana. But unlike other dietary supplements, and unlike marijuana in states where it's legal, CBD is not currently subject to any regulations or quality control standards. The FDA announced it would hold a hearing in May to look at the science behind CBD and how to develop a regulatory framework. 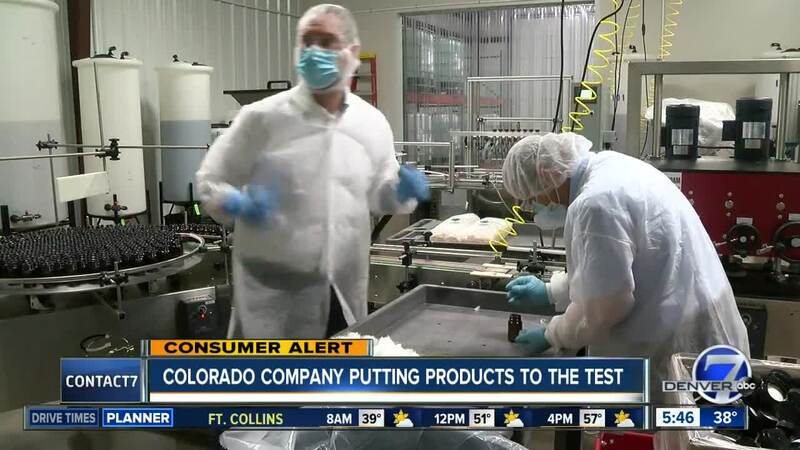 Until regulation comes, consumers are on their own, but a Colorado dietary supplement company is trying to help. Mineralife in Colorado Springs recently began producing and packaging CBD for outside vendors. As a dietary supplement maker, Mineralife is regulated by the FDA. It applies the agency's Good Manufacturing Practice standards to the CBD products it sends into the market. "We’re ensuring what we are creating is exactly what we anticipate it to be and that it's free from adulteration, or any sort of contamination," said Mineralife Nutraceuticals owner and founder Neil Butterfield. Butterfield said he ventured into the CBD world because more and more vendors were requesting help packaging their products. But as he researched the industry, there were concerns. "What I found is there are some guys out there who have absolutely no clue what they’re doing," he said. "And there is an element out there that’s in it for the money and just want to get it to market as quickly as possible. The vast majority though, I was pleased to see, had good intentions — they were just unaware of how to get it done properly." CBD products that come through the Mineralife lab are tested and confirmed to be free of bacteria, heavy metals or other contamination. Chemists also ensure the formulation and concentration of CBD match what it says on the bottle. That's reassuring to consumers like Robinson. In the years since her first bad experience, she's been able to find products she trusts. She now uses CBD drops to treat issues like anxiety and joint pain. "I know people who won’t try it because they’re afraid," she said. "And I think in order for it to be completely over that hump where it could start to replace things like Percocet or anti-anxiety medications, I think it's really important to know what you’re getting."